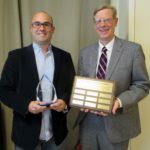 The 2017 Hansler Award Recipient: Chris Garr! At MAHO’s annual meeting on December 6, 2017, Steve Hansler presented the 2017 Hansler Award to Chris Garr. For the last several years, Chris has worked with MAHO staff on the ADA Cleveland coalition. Through his work at Youth Challenge, Chris has referred several young people to the Vistas Apartment Communities. All who know him speak of Chris’s commitment, passion, and outstanding sense of humor. Youth Challenge (YC) brings together young people with physical disabilities and teen volunteers through adapted sports. Chris began volunteering at YC when he was 12 years old and now serves as Director of Program Services. He serves as co-chair of the ADA Cleveland executive committee, where he works diligently and enthusiastically to eliminate barriers and increase accessibility in Cleveland. Chris also co-teaches a course on Adapted Physical Education at Baldwin Wallace University. “I met Chris through Youth Challenge when he was a 12 year old volunteer and I was a 4 year old participant. I was one of his first partners and although my speech has never been easy to understand, from the very start Chris did everything he could to make sure he understood me. Chris has brought many improvements to the programs at YC; one of which is a focus on what happens to people with disabilities after high school. His first step was to implement an internship so participants of YC could see what happens behind the scenes in how YC operates. As I’ve gotten to know him more over the years I’ve seen how Chris seems to pull the best out of every person he meets. I am so thankful he thought enough to take a chance on me and give me my first job in a professional setting. The 2016 Hansler Award Recipient: Ann Russell! We are delighted to announce that Ann Russell has received the 2016 Stephen P. Hansler Award. Ann joined the Maximum Accessible Housing of Ohio Board of Directors in the 1990s and served two terms as Board President. In addition to her work on the Board, Ann assists the MAHO staff in the office as a clerical volunteer. Ann initially studied Zoology at Ohio Wesleyan University, then went to graduate school at Case Western Reserve University to get a master’s degree in Physical Therapy. After several years of clinical work in Cleveland and Boston, Ann joined the faculty at Cleveland State University in the Physical Therapy Program. With an increased interest in research, she attended the University of Iowa, graduating with a PhD in Exercise Science. Over the years she has had varied experiences: she volunteered at a camp for children with muscular dystrophy and held a post-doctoral research position at the University of Washington in Seattle and other faculty positions at Cleveland State, Gannon University, and Walsh University. She is presently retired from clinical work. With a vocation in physical therapy, Ann’s interest in MAHO’s mission is obvious. Before joining the Board, she was well aware of the housing issues of many of the people she worked with and was glad Kathy Cotman introduced her to MAHO. Ann has been a strong advocate of the organization and encouraged others to share their time, talent and treasure with MAHO. As a Board member, Ann thoroughly analyzes issues to arrive at correct decisions. As an individual, she almost always puts the needs of others before her own. She has served eleven years on the Executive Committee, where she has shared her knowledge of MAHO’s history and combined it with a passion for the mission, vision and values of MAHO. Ann has been a steady influence, guide and mentor to many of its Board members, both past and present, and she ranks among the top Board members in service to MAHO. We are very appreciative of Ann’s dedication to increasing and improving accessible housing options for everyone. We are proud to honor her with the Hansler Award. 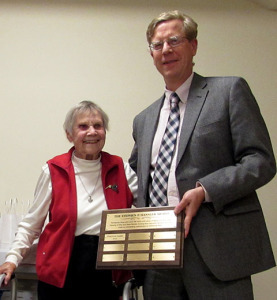 The 2015 Hansler Award Recipient: Mary Ann Gehringer! We are delighted to announce that Mary Ann Gehringer has received the 2015 Stephen P. Hansler Award. Since meeting Steve 31 years ago, Mary Ann has supported Maximum Accessible Housing of Ohio (MAHO) as our auditor and friend. As our auditor, Mary Ann helped create accounting systems that worked as MAHO grew into the organization it is today. Mary Ann consistently went above and beyond her role, informing others of MAHO’s accessibility experience and taking part in MAHO events. When Mary Ann’s husband, Mike, was diagnosed with a brain tumor that caused limited eyesight, speech difficulties, and mobility issues, Mary Ann knew that Mike was going to need accessible housing. She sought all the information she could to make her home accessible including, of course, consulting with Steve to utilize his expertise. Mary Ann renovated all living areas that Mike would be using and even bought a completely accessible motor home, complete with a chairlift. With her expanded accessibility knowledge, Mary Ann has become a resource for numerous others dealing with new disabilities and became a fierce advocate for accessibility. Now, despite battling her own personal health issues, Mary Ann has never stopped being a source of positive council and has been a blessing to everyone that she has touched. 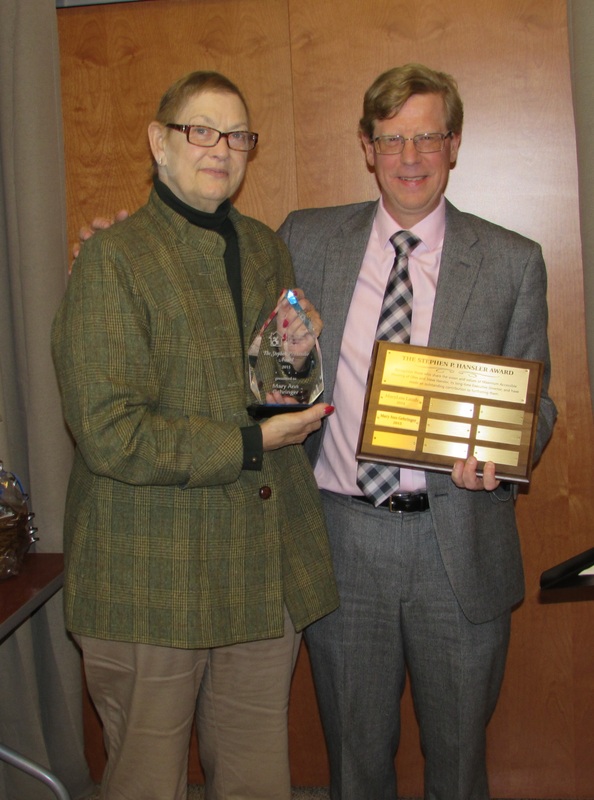 We are appreciative of Mary Ann’s support for many years and her continued advocacy for accessibility and are proud to honor her with the Hansler Award. The 2014 Hansler Award Recipient: MaryLou Lamb! We are very excited to announce that MaryLou Lamb received the inaugural Stephen P. Hansler Award. MaryLou has been a part of MAHO since its beginning: she helped found the organization in 1981, served as a Board member for over 25 years, and is currently an Emeritus Director. She has made outstanding contributions to furthering the mission, vision and values of MAHO. MaryLou graduated from Ashland Theological Seminary with a Master of Divinity degree. She has spent over 30 years working in Cleveland and the surrounding areas as a teacher, program director, consultant and Pastoral Disability Specialist. MaryLou was part of the Outreach Ministry of the Catholic Diocese of Cleveland for 15 years and served as the Program Coordinator and Director of the Task Force for Persons with Disabilities at Lutheran Metropolitan Ministry for seven years. MaryLou also authored the book A Star and a Rainbow for Benji, which was inspired by two boys she knew through her work at the Outreach Ministry. MaryLou received the ARC Cuyahoga County Award in 1973 for advocacy and innovative new programs and the Governor’s Award for Outstanding Service in 1998. MaryLou has been a tireless advocate for people with disabilities and has made significant contributions to improving their lives. MaryLou considers it an honor to receive the Hansler Award and is happy to have remained a part of MAHO for over three decades. 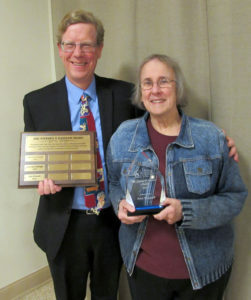 We are very grateful for MaryLou’s excellent work and proud to honor her with the Hansler Award.